The question of whether we can foster growth and innovation while promoting individual freedoms poses a challenge for everyone studying and working on innovation and development policies. Whilst innovation literature is largely dominated by a focus on efficiency, development literature tends to focus on equality and pays less attention to mechanisms fostering economic and social change. This book aims to move beyond these barriers and to identify development policies that foster both efficiency and equality, exploring the connection between innovation policies and the improvement of individual freedoms. Capabilities, Innovation and Economic Growth argues that we can answer these questions by focusing on the relation between Amartya Sen's human development approach and the Neo-Schumpeterian analysis of innovation systems. After considering the connections between the two schools of thought and the way they enrich each other's perspectives, chapters go on to show how policy can support virtuous circles in which innovation, human development and economic growth interact and mutually reinforce each other. This is undertaken through the descriptive analysis and the empirical testing of a sample of nations and European regions. 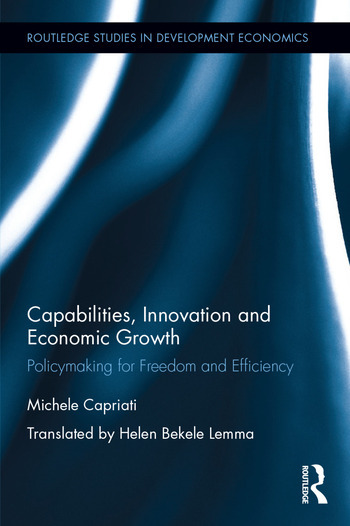 The volume concludes with an exploration of the contribution that the capabilities approach can give to the design of innovation policy, and with the analysis of macroeconomic policies favorable to innovation and human development. This will be essential reading for: students and academic economists interested in development, growth and innovation; policy makers and officers in charge of defining development and innovation plans at national and regional level; and consultants and managers in development agencies implementing innovation and development projects. Michele Capriati is Professor of Economic Policy at the University of Bari, Italy.